The roots of the garden Angelica are an excellent tonic and carminative. The infusion will relieve flatulence stomach-ache. Angelica tea is warming to the soul and body bitter but not unpalatable. 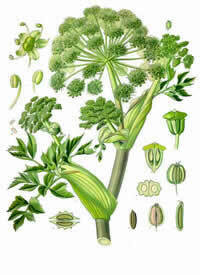 Angelica is a aromatic bitter herb excellent for digestive problems, settling a nervous stomach and calming tension. Recipe Instructions: Herbal Tea :Add 1 tablespoon of mixed herbs to 2 cups water, Bring to a boil, then simmer on low heat with the lid on for 10 minutes. Drink warm, before or after meals. Add a bit of honey to bring out the mellow taste.